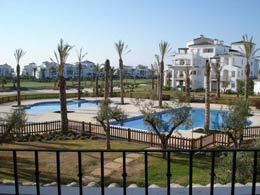 Apartment Elvyra is situated on La Torre Golf Resort, close to the Costa Calida in the region of Murcia, Spain. Here the climate makes it an ideal destination all year round. With over 315 days of sunshine a year, it has hot summers and mild winters. La Torre Golf Resort, completed in 2009, is one of six luxury resorts in the area by Polaris World. Those staying at the apartment are able to use all the resort facilities, including the 18 hole Nicklaus designed golf course, 16 pool locations and tennis courts, plus the indoor pool, fitness centre and spa at the 5* Intercontinental Hotel on site. 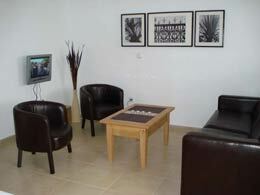 Golf is also available at the other Polaris World resorts. The resort is situated between the Costa Calida and the historic city of Murcia, about 15 minutes drive inland from two seas - the Mediterranean and the tranquil Mar Menor, the largest salt water lagoon in Europe. For nature lovers, there's the rugged, unspoilt coastline of the Calblanque Nature Reserve; the salt flats with flamingos and natural therapeutic mud baths at Lo Pagan; and hiking, rock climbing and mountain biking in the Sierra Espuña Regional Park. Numerous other sports are available in the area - sailing, canoeing, water ski-ing, horse riding, go-karting and cycling. Cultural activities include the San Javier Jazz Festival, local music events, art, theatre and fiestas. Sightseeing attractions are many and varied, with ancient Cartegena's Roman sites, Lorca's castle and the cathedral city of Murcia nearby. If you are looking for a restful break, relax by the pool, stroll to the restaurants and indulge yourself at one of the many health spas in the area while staying at Apartment Elvyra.